Olympic medalist Jessica Ashwood claimed a thrilling victory in the women’s 5km Grand Prix at the Noosa Summer Swim Festival during the weekend. 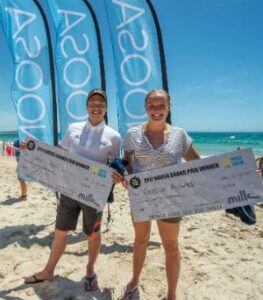 Men’s and women’s 5km champions Yasu Hirai & Jessica Ashwood with their winners checks. The 23-year-old finished in 54min 56.9sec, just 0.2sec ahead of Sunshine Coaster and Olympic open water swimmer Chelsea Gubecka. Another Sunshine Coast local, Kareena Lee, finished third, another 31 seconds adrift. For Ashwood, who claimed a bronze in Rio as part of the Australian women’s 4x200m freestyle relay squad, it was a promising win over the longer distance. Meanwhile, in the men’s race, it was a battle of the Olympic distance swimmers with five time Japan open water champion, Yasu Hirai, winning in 51min 38sec, just four seconds ahead of Jack Mcloughlin, who competed in the 1500m at Rio and with Jarrod Poort, Australia’s cult hero from the Rio 10km marathon, only one second back. This summer the Noosa Summer Swim expanded to a two day program of events with the introduction of the 5.0km Grand Prix event on Sunday February 12. The start studded field proof of its instant popularity and the growing interest in open water events with Australia’s most accomplished pool swimmers. Olympic golden girl Libby Trickett presented 2017 champion, Jessica Ashwood with the silverware after coming a close fourth in the 2km event herself. Event Ambassador, Michael Klim, also took part in the events and isn’t surprised that more people flock to the event every year. 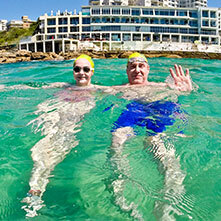 The next swim in the World Series Swims series is the St Kilda Mile on 18 March.